Nowhere is Mozart's maturity and mastery more apparent than in the chamber music he wrote during the last 10 years of his life. These 16 lectures take you deep inside the structure of Mozart's chamber masterworks to reveal his hand at work. This is an amazing opportunity to hear, study, and enjoy a selection of immortal musical compositions that Professor Greenberg calls "a blessing of inconceivable richness". You will learn the basic "language" that all 18th-century composers used to write Classical music. You'll also explore the subtleties of Mozart's technique as a composer: his ability to make art "artless" - music that is enormously complex and sophisticated but which sounds simple and effortless - and to know how and when to bend or break the rules of composition. Professor Greenberg teaches you about the three different "generic types" of chamber music that Mozart composed: string quartets, works for piano and another instrument or instruments, and combinations that employ neither a string quartet nor a piano. The centerpiece of these works, drawn primarily from Mozart's "golden years" in Vienna, 1781-1791, is the set of six Haydn string quartets that Mozart dedicated to his friend Joseph Haydn. With a delightful blend of music analysis and appreciation and biographical narration, Professor Greenberg paints a detailed and compelling portrait of Mozart as man who commanded seemingly superhuman musical ability but could be all too human. You'll come away with a solid grasp of Mozart's profound impact as a composer and an improved understanding of what it takes to compose great music. Would you listen to The Chamber Music of Mozart again? Why? Until now I tended to overlook the chamber music in general or thought it was rather entertaining music. Absolutely not! Prof. Greeberg shows and explains it to be like a small shining diamods full of life, humour, both of amusement and intelectual pleasure too. My first attempt to break into the world of really enjoying music came when my husband bought. The Concert Masterworks. Until then, I knew my favorite music was Bach’s and Mozart came second and Beethoven and Vivaldi and Teleman were in there somewhere. I was pretty much a Baroque girl. When I listened to the first two lectures, I realized I was missing a lot. So, I got the How to Listen and Understand Great Music. Loved it. Listened until I got to the Classical Period and went back and did Bach and the High Baroque. Then on with the Classical Period--which I have not finished yet because I did Great Masters: Mozart and am about to start The Concerto. And then, either The Chamber Music of Mozart or The Symphony. I am enjoying Dr. Greenberg’s expertise and attitude so much that I keep diving down new rabbit holes! Dr. Frank A. Salamone Sr.
What did you love best about The Chamber Music of Mozart? Mozart is great. Greenberg explains why he is great and adds to our understanding. What other book might you compare The Chamber Music of Mozart to and why? I would compare this audio to Greenberg's others on great music. I like his humor, his clarity, the depth of his knowledge. Here is the real Mozart not the buffoon of Amadeus. If you are mature enough to listen and pay attention. this is an audio to help you understand the structure of Mozart's music and its role in aiding his music. I'm near the end of my second time through and still learning more. 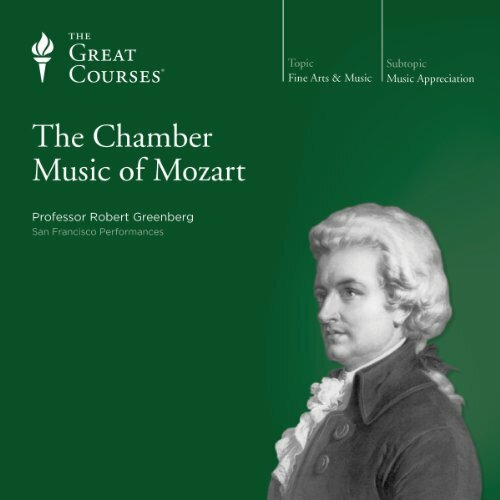 Robert Greenburg has increased my understanding and enjoyment of Mozart, chamber music, and all the (good) music I listen to. Robert's lectures are great and the balance between listing to Mozart's chamber music and his comments is perfect. Note: Don't be surprised if you have to buy: Mozart:The Guarneri Quartet plays String Quartets and Quintets while or at least after you are listen to this set of lectures. A bible written in honor of Mozart. Fantastic work dr. Greenberg. I was sad at the end, not because of the death of Mozart but...the book ended. Most people think of Mozart as primarily a composer of operas, and in fact he did compose some of the best operas ever penned. (*koffMarriageofFigarokoff*) but his output was enormous for a man who lived only 35 years, and included a good deal of chamber music. To be clear here, chamber music can be defined as instrumental music played by a small ensemble, with one player to a part; think quartets, trios, quintets, and the like. One group of chamber pieces is known collectively as the Haydn Quartets, a set of six string quartets dedicated to Joseph Haydn, Mozart's dear friend and champion, is discussed at length by Professor Greenberg, who puts them into the context of the era, and the musical milieu of Vienna. He also explains that in spite of the fact that you can almost never say that such-and-such a composer invented such-and-such a form, Mozart did indeed invent the string quintet. Above and beyond the analysis of the actual music, it's information like that which makes Greenberg's lectures so interesting. He has a comprehensive knowledge of music, true, but his grasp of musical history, and history in general, is awesome. The course itself is short, sixteen lectures, but with so much information packed into it that it felt like a semester's worth of music theory, history, and more. It's true that the good Professor can sometimes be a little much, but once I settle into the course I usually forget everything but the course itself. Over all the courses I've listened to, I've grown used to him, and find his humor endearing, if it does sometimes annoy me. If you love music, Professor Greenberg is your guy. His explanations are clear and concise, and he has a gift for contextualizing the music he's teaching us, making the pieces, the composer, and the musical era much easier to comprehend, and to enjoy. another great class from Dr G. there is so much material presented in a way that will make it enjoyable to listen to it again and again. Dr Greenberg is so passionate about music. His insights make the music more accessible. Mozart is fascinating. If you like music at all, this will draw you in and give you insights into great music.